Lagos and indeed, much of the entire South-West was on tenterhooks yesterday as political permutations against a second term for Governor Akinwunmi Ambode reached a crescendo with the unravelling of the governor’s political base. Worse, the governor’s prospects of serving out the rest of his first term, it was learnt, was hanging in the balance upon claims of momentum to remove him from office if he does not drop his second term aspiration. The governor’s support base which had been built around Asiwaju Bola Ahmed Tinubu unravelled after it emerged that a major contender for his office had emerged from one of the major political structures in the ruling All Progressives Congress, APC in the state, the Mandate Group. The Mandate Group, Vanguard gathered, is presenting Mr. Jide Sanwo-Olu, incumbent Managing Director of Lagos State Property Development Corporation, LSDPC. Ambode’s prospects outside the APC were also not being helped with the emergence of billionaire Mr. Femi Otedola as an aspirant on the platform of the Peoples Democratic Party, PDP. Otedola who is vacationing in Paris, it was learnt, has, however, vowed not to contest against Ambode. In the face of the unfolding battle, many stakeholders spoke in hushed tones yesterday on the crisis of a second term that has shadowed successive successors of the political leader of the state, Asiwaju Bola Tinubu. Political sources in the state yesterday said that after challenges that Tinubu got from Fashola, it was unlikely that Hamzat, one of Fashola’s options as a successor could get Tinubu’s support. That means that the momentum was gravitating towards Sanwo-Olu who ironically served as a commissioner in the Fashola government. 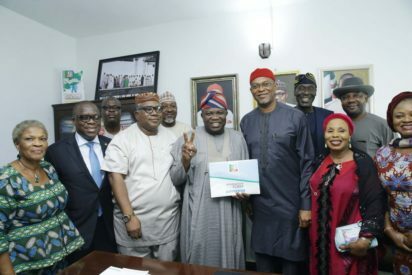 It was learnt yesterday that the chairmen of the 57 local government councils and development areas in the state had in a show of force endorsed Sanwo-Olu’s forms. “That was meant to send a message to Ambode,” a political chieftain told Vanguard yesterday. Ambode’s options were last night being narrowed as reports of an impeachment plot started swirling around political meetings around Lagos House and the State House of Assembly. It was also learnt that emissaries sent by Ambode to Tinubu had been shut out, making the resolution of the Ambode crisis difficult. The situation left many political stakeholders in the lurch, with many saying that they were confused. This was mainly caused by the fact that Tinubu as at last night had not made a pronouncement. However, the body language of the national leader was reflected by the fact that many of his trusted aides were said to have gravitated towards Sanwo-Olu. It was leant that though efforts were being made for reconciliation, it was gathered that the face-off worsened seriously on Monday after Ambode went to Abuja to collect the APC governorship form. He was said to have obtained the form without a full reconciliation with Tinubu. After collecting the form, Ambode proceeded to make a public declaration at the Old Task Force Ground, Alausa, Ikeja, without the obvious presence of chieftains and leaders of the party. The fact that the declaration was not done at the party headquarters at Acme Road, Ogba, in Lagos sent negative signals as to the possibility of his estrangement from the Tinubu mainstream in his re-election bid, a source said. Few of the local government chairmen who attended the declaration left midway and some even left before the ceremony started at 4.00 p.m. on Monday. Before the declaration ceremony, chairman of the Lagos State chapter of the APC, Babatunde Balogun had held a closed-door meeting with all the 57 local government chairmen at the party’s Acme Road office before they later dispersed and shunned the governor’s declaration ceremony. Vanguard reliably learnt that the party members were currently confused and are awaiting the declaration from the National Leader of the party. Ambode yesterday summoned a closed-door meeting of some of his top associates at Lagos House, Alausa, Ikeja, in order to weigh the options for the governor. The outcome of the meeting could not be deciphered as at press time yesterday. Though the crux of the meeting was unknown, it was gathered that the governor was open to all options, including dumping the party for another or walking away to wait for another opportunity from the party. The governor’s capacity to fight back within the party or outside, it emerged, had been limited by his strained relationship with the Lagos State House of Assembly. There were reports from within the House that the governor had instigated a plot to remove the speaker of the House of Assembly, Mudashiru Obasa, a strong Tinubu loyalist. That plot quickly unravelled. It was also learnt yesterday that a sizeable proportion of the members of the State House of Assembly attended a meeting at the party secretariat to discuss the development. One of the sources, who spoke under anonymity with Vanguard, said the lawmakers have resolved to commence impeachment moves against Ambode as soon as they resume from the recess. “It could be rumour, but the source I heard it from was an indication that it is nothing far from the truth. “Although, it was debunked, but the people I heard it from were those I believed knew what they were saying. The people I spoke with gave it a possibility that, it is real. Asked, where the impeachment move is coming from, he said, “Unfortunately, it is coming from both the Lagos State House of Assembly and all the LCDAs. According to another source, all the chairmen of APC in 20 LGAs and 37 LCDAs have signed the nomination form of Mr. Babajide Sanwo-Olu as an alternative choice. Ambode’s troubles with the political establishment in Lagos had for long been reported in political circles in the state. A South-West governor close to Tinubu was said to have been at the forefront of the agitation to stop Ambode’s second term ambition. Vice-President Yemi Osinbajo; Oba of Lagos, Oba Rilwan Akiolu, and Majority Leader of the House of Representatives, Hon. Femi Gbajabiamila, it was claimed had prevailed on the APC leader to support Ambode’s re-election plan. At the centre of the allegations against Ambode was that the governor alienated the political mainstream in the state. Some others described the governor as heady with a capacity to decapitate Tinubu and his associates should he get a second term. The issue of the PSP operators in the disposal of refuse was said to have been very touchy for the political elite, many of whom were entrenched in the PSP scheme as a way of servicing the political base. Ambode, however, dismantled the scheme without as much appreciation of their role. Even worse for the governor was the fact that the alternative arrangement made to replace the PSP operators have not done a good work, leading to mounting heaps refuse in the commercial capital of the country. Party stalwarts had also complained that traditional acts of patronage that normally came the way of government did not come from Ambode. However, Ambode it was claimed, decided not to patronise the political leaders on the premise that he had left politicking for Tinubu while he concentrated on the act of governance. The face-off between Ambode and Tinubu came to the fore recently at a stakeholders’ meeting at the party’s secretariat, at Acme Road, Ogba, Lagos where Tinubu throughout the meeting failed to raise the hands or endorse a second term for Ambode which was a rude shock to members in attendance. Vanguard gathered that various support groups which had been created for Ambode’s re-election campaign had for some time been put on hold, pending final clearance from Tinubu. One of the chieftains who confided in Vanguard at the weekend, simply stated, “Ambode is at a crossroads” because all his supporters have backed off as all efforts to resolve the difference met a brick wall with Tinubu who insisted on a fresh candidate (kept to his heart) for the job. Oba Akiolu was said to have tried to convince Tinubu to change his mind, but all proved abortive. However, it was learnt that members of the State Executive Council have been jittery over the development, not knowing where the pendulum will swing in the 2019 governorship ticket. Those with political aspirations were said to be worst hit as they could be shown the way out at any moment. Most of them have started making moves, meeting the party leadership and stakeholders for an endorsement from Tinubu and other decision-makers. Tinubu’s associates were last night not very comfortable with the development, fearing that the national leader could be taking a very big risk if he decides to dump Ambode. “The situation is not very bright for any side because as at this time, Asiwaju is already grappling with forces in Abuja and to compound it with additional enemies from home is not something we are very pleased to talk about,” an associate of the national leader of the APC said. Meanwhile, a school of thought in Lagos claimed last night that the present crisis may not be directed at derailing the governor’s second term ambition but merely to whip him in line. Meanwhile, it emerged that oil magnate, Mr Femi Otedola has emerged as a possible frontrunner in the PDP as a candidate for the party. However, sources said that Otedola’s bid could be a fightback by the Ambode camp who could project him to fight whosoever could emerge from Tinubu’s camp. According to sources, the billionaire businessman had maintained that he would not run for the governorship against Ambode. However, a source told Vanguard: “Just like the current governor, Otedola is from Epe. The thinking and good news now are that if the APC ticket goes to Ambode, the governor will still be from Epe. On the other hand, if Ambode does not get the ticket and Otedola runs for governor and wins, the governor would still have come from Epe. When contacted, spokesman of Lagos State chapter of PDP, Mr. Ganiyu Taofeek said the PDP is not aware, adding that having him in the party would be a good development.